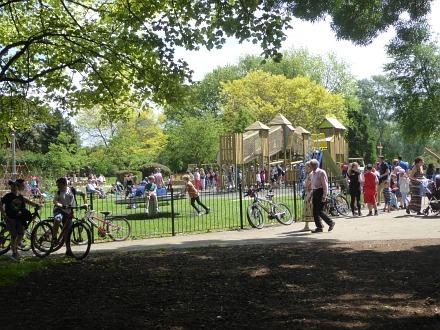 Over the weekend the Abbey Play area was opened, and proved very popular. Although 3 or 4 times the size of the previous play area, it was full at times. 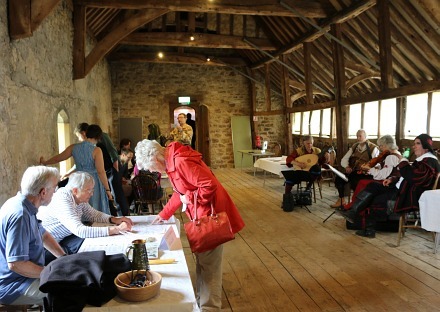 On Bank Holiday Monday the Abbey Buildings also opened with a number of activities. The Oxford Waites performed in the Long Gallery, and different theatre groups rehearsed, and music was performed in the Unicorn Theatre, . 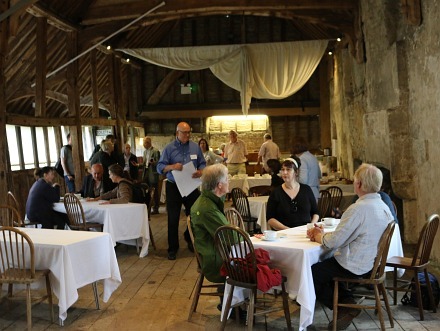 Also in the Long Gallery food and drink was being served, and societies had stalls. Eight different walks set off from the Market Place, some in the morning and some the afternoon. and the Saint Edmund Walk led by Anne Dodd. Both were well researched and very interesting. 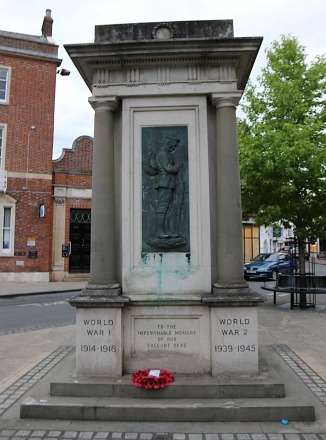 The Friends of Abingdon have launched a St Edmund project to give more prominence to St Edmund, and are linking up with other places where he is well remembered. 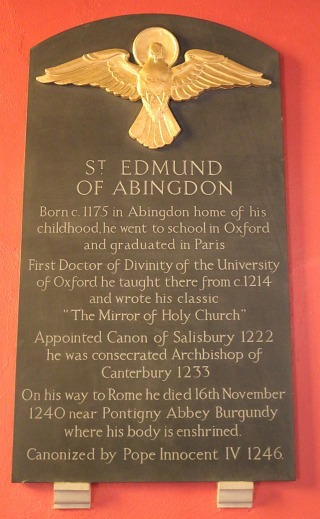 The plaque above is in the St Edmunds Chapel in Our Lady and St Edmund’s Church, Abingdon. P.S. The Abbey Buildings are open to the public from May 1 to September 30, between 2pm and 4.30pm on Wednesdays, Thursdays, Fridays and Sundays, but not usually with so much going on. 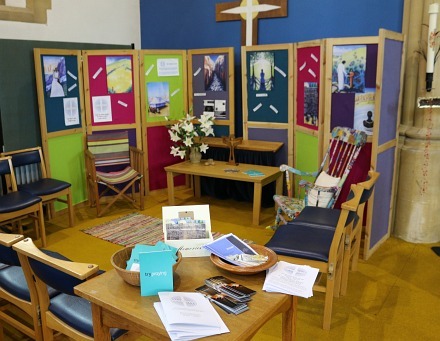 Between Ascension Day (25th May) and Pentecost (4th June), some of the churches in Abingdon are taking part in the 11 days of prayer initiative begun by the Arch-bishop of Canterbury and called Thy Kingdom Come. 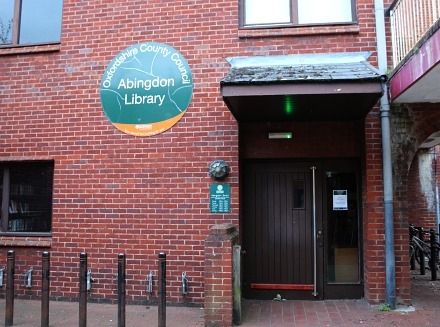 The full Abingdon programme can be seen on the Trinity web site. 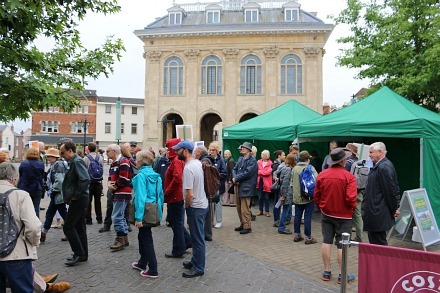 This afternoon, Deacon Selina Nisbett led one of the events – a Prayer Walk around Abingdon – starting at Trinity, pictured above. 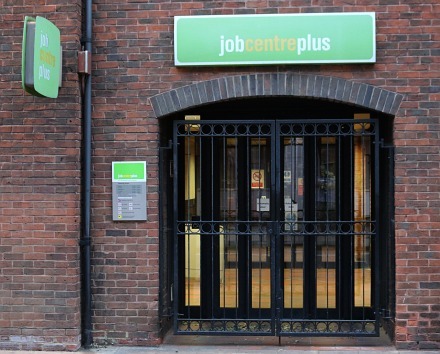 Pray for those marginalised in society; the unemployed, those on zero contract hours and all who struggle to make ends meet. 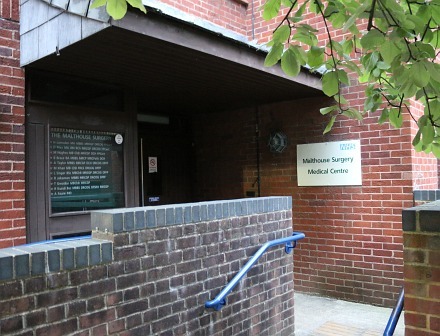 Pray for all those who work in the health profession, paramedics, all who work in hospitals and hospices, hospital chaplains, and all those we know who are sick in body, mind and spirit. Pray for teachers, authors, academics and those employed in research that they might use their wisdom to transform the world. Give thanks for those who use their creativity to share their faith with others. Pray that we may use creativity to build bridges where there is brokenness. A few sheets were left in St Nics for anybody who wants one. 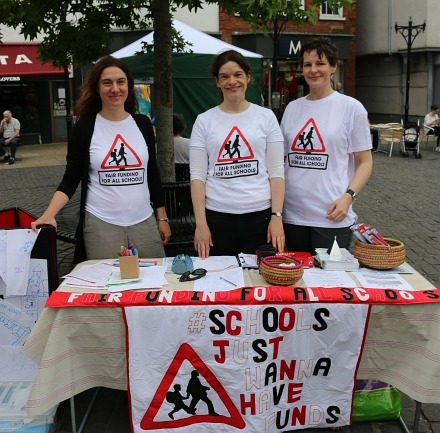 There is the danger that school funding will be cut in real terms for many schools, and so the mass parents’ campaign fighting these cuts – Fair Funding For All Schools, were on the Market Place this morning. 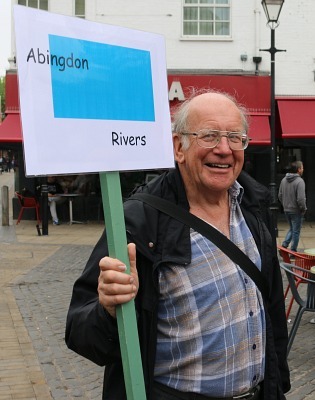 They had a petition, information, and had met some of the candidates standing for the Oxford West and Abingdon constituency. 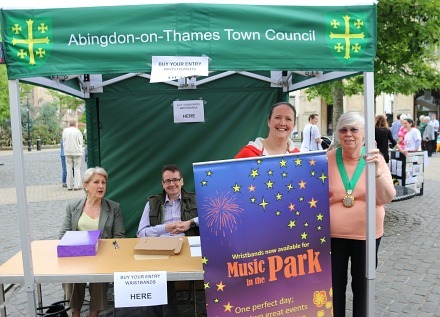 Also on the Market Place this morning were Alice Badcock, last year’s Mayor, and Margaret Crick, the new Deputy Mayor. Fun in the Park, and Music in the Park are next weekend, on 3rd June, and they were selling wristbands for Music in the Park. Wristbands usually sell out before the day. Gates open at 5pm and there will be live performances from Flexamuscle, Shakedown Prophets, AGC Rock Band and Bigtopp. The evening concludes with a Proms Concert by Abingdon Town Band and a Grand Firework Display. 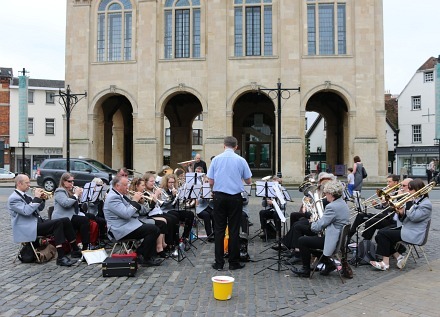 There was also music on the Market Place, and a stall selling cakes, thanks to Abbey Brass who were raising funds so they can continue to buy instruments – for training new members. 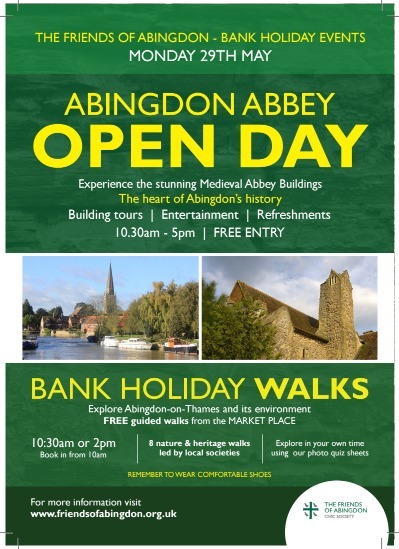 From 10.30am to 5pm on Bank Holiday Monday the Abbey Buildings will be open with some entertainment and children’s activities. 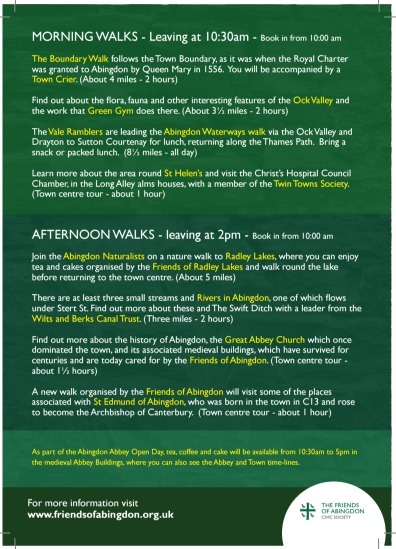 Also, thanks to the Friends of Abingdon, there will be a number of organised walks around Abingdon. 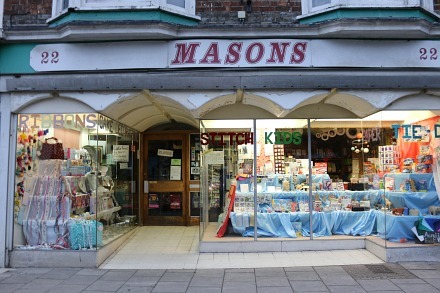 There is a new one in the afternoon visiting the places in Abingon most associated with St Edmund of Abingdon. He was born, “probably in West St Helen Street”, and there was a chapel dedicated to his memory somewhere nearby. 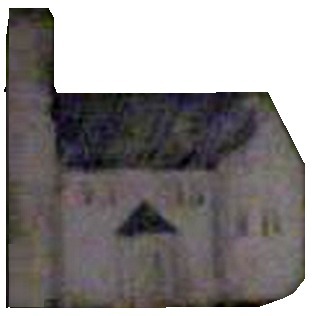 There is a church-like building, half way up West St Helen Street, depicted on the Medieval Monks Map in the museum. So this could have been what that chapel looked like.